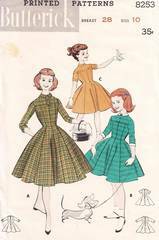 Original vintage sewing pattern from early to mid 1950's. Dress with princess seaming has yoke detailing. Optional tab and button trims the yoke. Short or 3/4 length cuffed sleeves. Pattern is complete. The pieces have been meticulously cut and folded. Envelope has one small, light spot but is in otherwise excellent condition.